DropBot is a “research” instrument in a beta stage of development. Several DropBot systems have been built and are in daily operation in the ​Wheeler lab. We provide the design to the microfluidics community with no warranty or guarantees in the hopes that some people will find it useful. This information is provided “as is”. No responsibility is accepted for any damage, injury or death as a result of assembling a DropBot system or using the information on this website. Working with Digital Microfluidics involves high voltage (>100VAC). Only persons who are competent at electronics assembly and who understand the dangers of high voltages should attempt to assemble a DropBot. Safe assembly and operation is the user’s responsibility. The assembled unit must be properly enclosed to prevent contact with high voltages and kept out of the reach of children. Keep the electronics away from liquids. We are constantly seeking ways to improve DropBot. If you have any ideas to make it more functional, easier to use, cheaper, or safer, please log a feature request or send an email to the ​developer list. For convenience, the ​KiCAD files, ​gerbers, and Bill of Materials (BOM) for all circuit boards are bundled in a single ​electronics zip file. 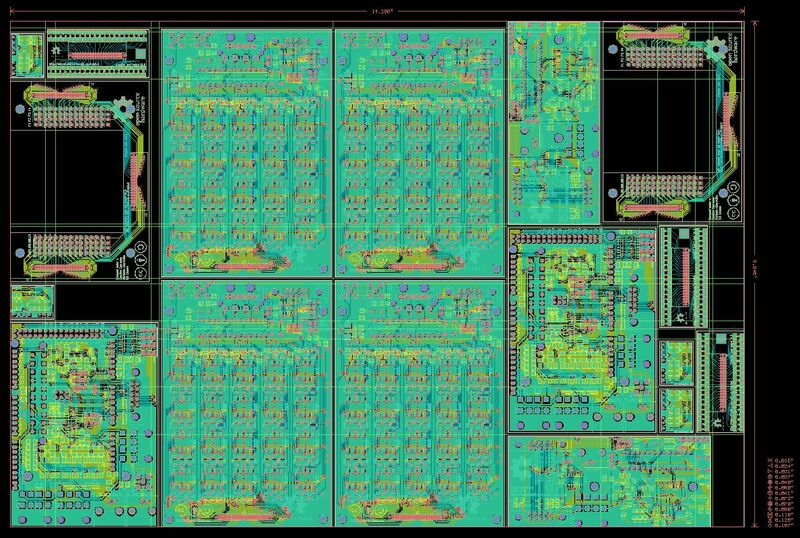 To order the bare PCBs, you will need to send gerber files for each of the board designs to a PCB manufacturer. If you're looking for a good program for viewing gerber files, we recommend the free/open-source ​gerbv. To simplify the PCB ordering process and to save money, the zip file contains a file called dropbot_electronics_v2.1.6-merged-gerbers.zip which contains all of the boards merged onto a single 14.5" x 10" panel. This should qualify for the ​Gold Phoenix 155 sq. in., 2-layer special price ($110 + additional fees for a multi-project panel and complex shapes). The default board options are fine, but you can pay extra if you want a color other than green and/or to get a silk screen layer on the bottom (which is a good idea). The merged gerber panel includes 2 ControlBoards, 2 SignalGeneratorBoards, 4 HighVoltageSwitchingBoards, 2 120ChannelDeviceConnector boards, 3 TestBoards, and 4 AntiAliasingFilterShields. Not all of these boards are needed for a working system (e.g., there's an extra copy of each of the required boards, and the TestBoard are optional). If you want to create a custom panel (e.g., if you want to change the number of copies of the various boards or change the panel size), we've written ​a blog post that explains the process. You'll need to solder the PCBs yourself, or alternatively, you can have them assembled by a 3rd party (e.g., ​Gold Phoenix), though assembly can be prohibitively expensive for small volumes. If you do decide to have boards assembled by Gold Phoenix, you may be able to save on the stencil fee (~$200/board design), since they should have stencils on file from previous orders. Note that each of the following links points to a zip file that was used to fabricate batch of a single design (Note that the *.pos files and BOMs have been updated to fix some errors, but the stencils should remain unchanged). In the past, we've always soldered the 120ChannelDeviceConnector board, ExtensionModuleProtoBoard and TestBoard by hand, so there are no stencils on file. If you decide to get any of these assembled, please post the stencil reference number here. Also, some of the parts on the included Bills of Materials are highlighted in red, which indicates that they are not to be placed during assembly. This is because they either are not soldered (e.g., shunt jumpers) or they are parts that cannot be sourced from ​Digi-Key (e.g., ​the Arduino Mega stackable headers). For those parts not available from ​Digi-Key, you can either make arrangements to mail these to Gold Phoenix prior to assembly (in which case you can remove the red highlighting), or you can solder them yourself afterwards. If you're soldering the 120ChannelDeviceConnector board yourself, check out ​this page for some helpful tips. The two mechanical sub-components are the case and the 120-channel device connector. The case is designed to be laser cut from 3mm acrylic. The pogo pin connector has some laser cut parts and others that are 3D printed. If you don't have access to a laser cutter or 3D printer, you can order these parts from online suppliers like ​Ponoko or ​Shapeways or find a local printer at ​makexyz. Most other parts can be obtained from either ​McMaster-Carr or ​Digi-Key. Some of the cable assemblies can be ordered from ​Samtec, but others must be assembled. 1The case can fit any power supply smaller than 125.0mm x 101.1mm x 65.5mm (assuming a clearance of 2mm on all sides). 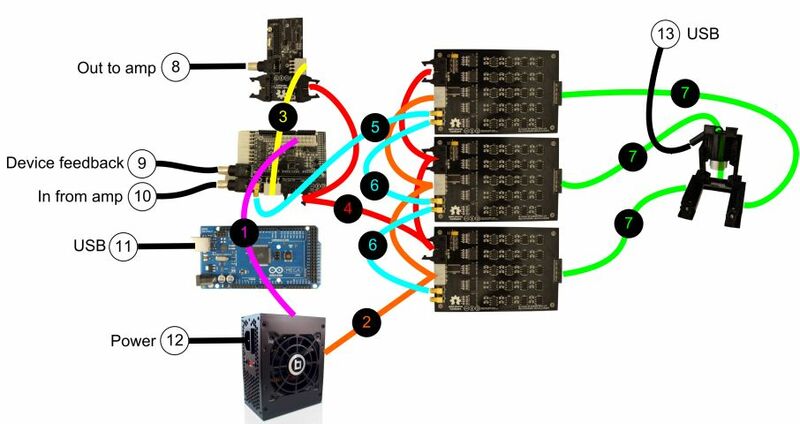 The only other requirement is that the power supply has at least 3 Molex 4-Pin connectors to power the HV switching boards. The following power supplies have been confirmed to fit: Diabolotek ​PHD380M and ​PSDA320, ​Coolmax CM-300, ​SilverStone Tech ST30SF and ​FSP FSP400-60GHS(85) (though this one ​requires an adapter). Note: do not perform the following steps until you've confirmed that the switching boards are working. If one or more of them have a short, applying a high-voltage signal may cause damage to the electronics. Also, ​avoid turning on the amplifier until after you have launched Microdrop.